The pasture on 8/3/2017 after two seasons of rehabilitation. 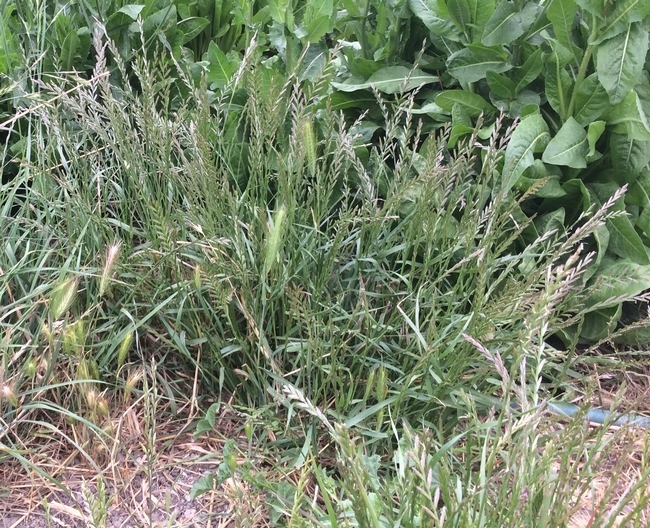 Foxtail (Hordeum murinum) is a pest plant that can dominate pastures on the Central Coast. It's not particularly good forage for livestock and the seed heads often get stuck in eyes, ears, and noses of livestock and pets. This annual grass is difficult to control, but that didn't stop Michael Cent, local landowner and pharmacist, from trying. Mr. Cent lives in San Juan Bautista (San Benito County) and has a 2.3 acre pasture that was infested with foxtail when he first bought the property. This article is a case study exploring Mr. 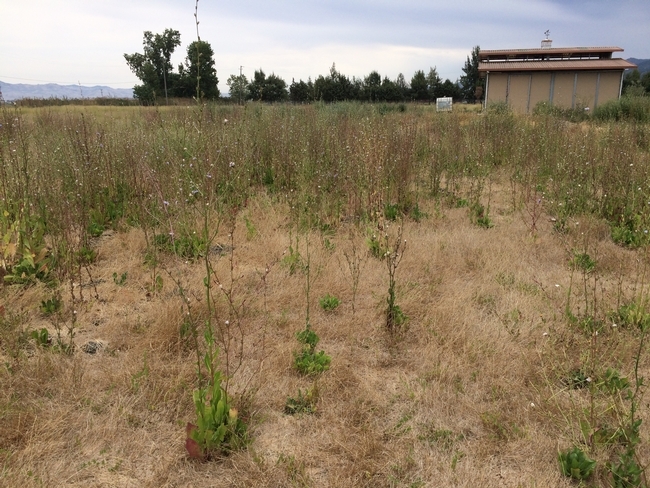 Cent's efforts to reduce foxtail and encourage more desirable plants to grow. The pasture in 2015 when it was dominated by foxtail. Photo credit: Michael Cent. The pasture was a horse pasture for many years, but the most recent previous owners used it as a llama pasture. The water table is high in the pasture as San Juan Creek is located just on other side of fence. 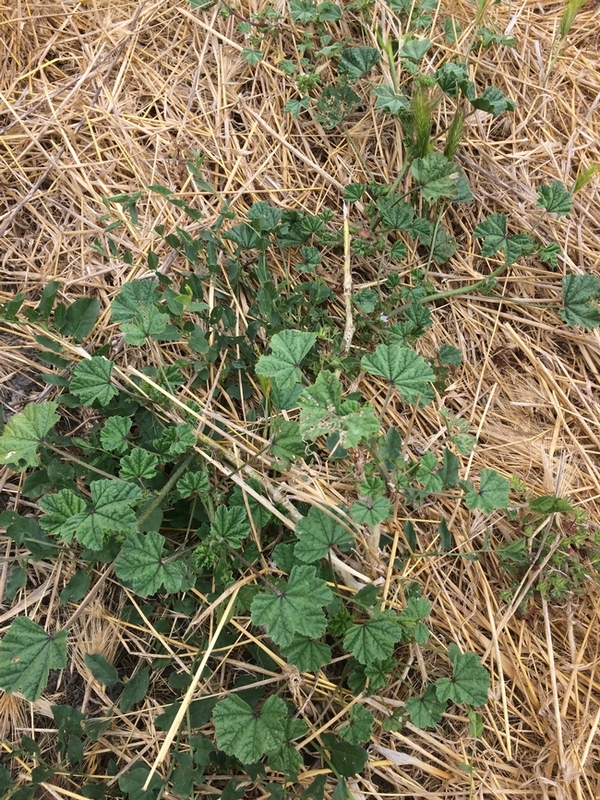 The three primary problem plants in the pasture are cheeseweed (Malva parviflora), bristly ox-tongue (Helminthotheca echioides), and foxtail (Hordeum murinum). Desirable species in the pasture include perennial rye and Harding grass. The Cents do not have animals in the pasture year-round, but use targeted goat grazing during the growing season to help achieve their vegetation management goals. Is it annual or perennial? Is it affected by frost? What soil pH range is required? Does it cause bloat in livestock? Does it require substantial amounts of Phosphorus or Potassium? What are the associated companion plants? How much does the seed cost? Is the seed local available? For each species, most of these questions were answered using its Plant Profile in the USDA (United States Department of Agriculture) Plants Database (https://plants.usda.gov/java/). Within the Plant Profile, for most plants, you can also find a Fact Sheet and/or Plant Guide which contain valuable ecological information. To keep shipping costs down he purchased what seed he could from L.A. Hearne in Prunedale. The remainder was purchased online. Mr. Cent was particularly interested in six point chicory, gala grazing brome and Kingston perennial rye, so before seeding on a larger scale, he seeded those species into small test plots and found that they persisted through heat of summer, even without watering. If you don't own a tractor, it's handy to have a neighbor who does. Luckily Mr. Cent had a neighbor who let him use his tractor. To prepare the pasture for seeding, Mr. Cent would have ideally used a disc, but he used what he had access to, which was a claw. He used the claw across the entire pasture to break up the soil. Then he hand seeded the grass and broadleaf seeds into the pasture. So far, he has seeded during two years: fall of 2015 and fall of 2016. Species seeded in the second year were those that were successful in the first year. There is no irrigation in the pasture. March 2016: 30 goats grazing the pasture. Photo credit: Michael Cent. In addition to seeding the pasture, Mr. 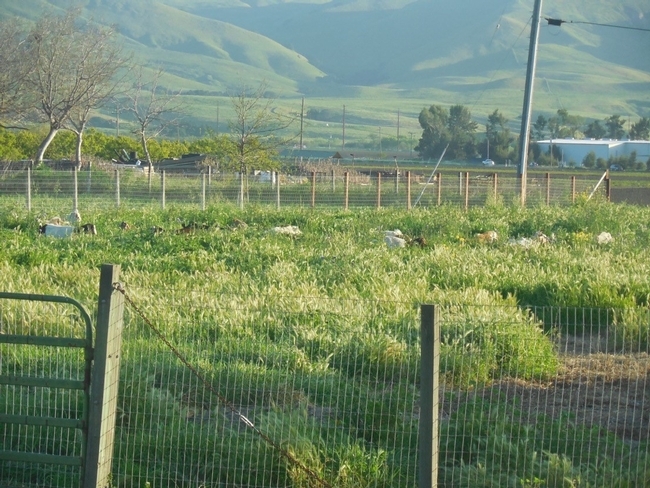 Cent contracted with Green Goat Landscapers, based in Morgan Hill, to bring in goats to graze the foxtail. 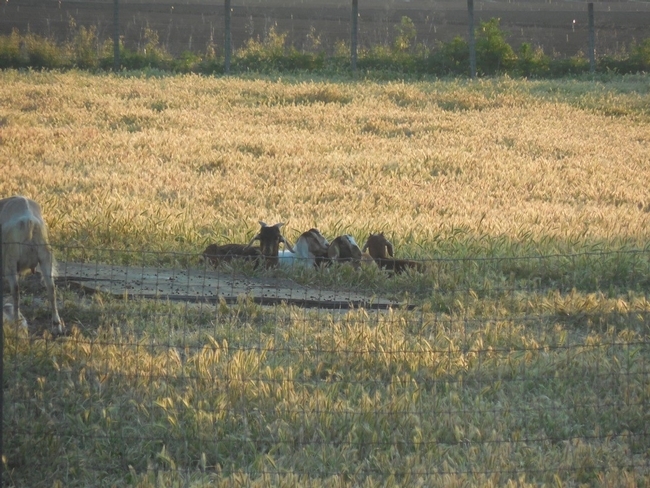 Sometimes targeted grazing operations will use goats and sheep together, but at this site, only goats were used because of concern that sheep would eat the vegetation down to the roots, potentially destroying the Harding gass throughout the field. The goal of grazing was to reduce both the weeds and fire fuels. Timing of grazing depended on when the ground dried up enough to have grazing animals and the availability of the goat contractor. In 2016, 16 goats grazed over a period of three months during the growing season. In 2017, 40-50 goats were brought to the pasture in February for about 3-4 weeks. With such low numbers in 2016, the goats didn't eat the foxtail, but when the density increased the following year, they did eat it. Mr. Cent prefers goat grazing to occur in mid- to late-spring, so by the time the goats leave the property there will be very low soil moisture and the vegetation won't grow up again until the next fall. That way no mowing will be required after the goats are gone. Targeted grazing will continue in the future each spring. The pasture's soil was tested for pH and nutrients to help determine which species to seed. But plants don't always do what you expect them to do. 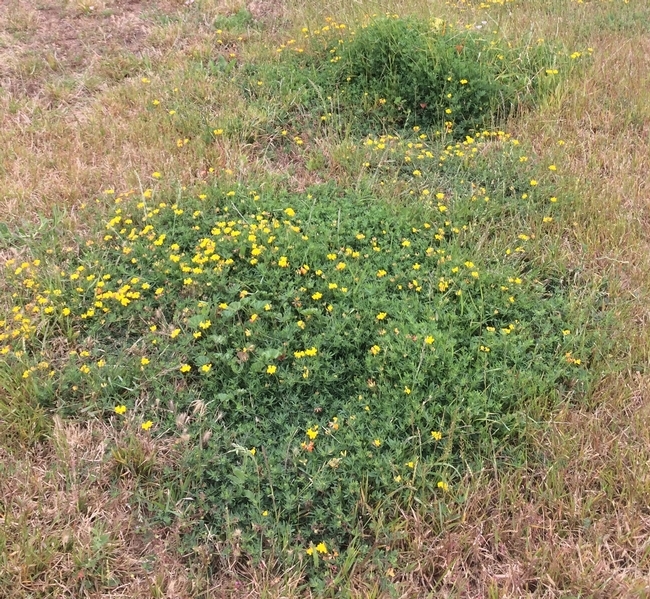 Birdsfoot trefoil grew well in areas it was not expected to, based on soil pH/nutrients. This species grew later in the season and seems to be well adapted to drought. When established, it formed a dense carpet that choked out everything. Trefoil attracted bees, especially bumble bees. Mr. Cent expects the seeding will be successful so will seed more next year. Crimson clover germinated and grew quickly early in the season. However, this species did not grow as well as anticipated in 2017 so will not be seeded again. Gala grazing brome did not do well in the pasture. This species looks similar to Bromus carinatus, a native perennial grass. Harding grass was seeded specifically to outcompete the bristly ox-tongue. It is palatable to livestock and should outcompete undesirable grasses, but it is clumpy and difficult to mow. One portion of the pasture was seeded heavily with Harding grass and six point chicory. Neither species had come up by 6/8/2017. This field was soggy for an extended period of time due to the heavy winter rains and Mr. Cent hypothesized this may have affected germination rates this year. Iron clay cowpeas are expected to compete with foxtail in the early season. This species was seeded in pasture, but was not successful. Cowpeas are frost sensitive and either seedlings died or it never germinated at all. Buckwheat seed was mixed with cowpea seed. Kenland clover was slow to establish but is showing exceptional drought tolerance. It started growing very well in early June. However, overall it is not as successful as he had hoped. Kingston perennial rye was quick to establish and is showing good drought tolerance. This year was an above average rainfall year so ryegrass is more robust than normal. This seeding was very successful. Flowers of this species were palatable to the goats and they seemed to prefer it. It also provided a food source for bees and other pollinators. Phacelia was seeded in both years, but only came up in first year. Rainfall was average in the first year compared to well above average in the second year. Mr. Cent hypothesized that it did not grow well in the second year because rainfall was too high. Lana vetch did not do well the first year so was not seeded again. Plantain has been slow to establish but is increasing in cover over time and is showing good drought tolerance. Plantain was added to the mix because it is a companion to six point chicory and is highly palatable to livestock. Six point chicory was palatable to the goats, has a long taproot, thrived in summer, and can grow taller than 5 feet. This species can be planted in any desired density and might be effective and outcompeting many weeds. 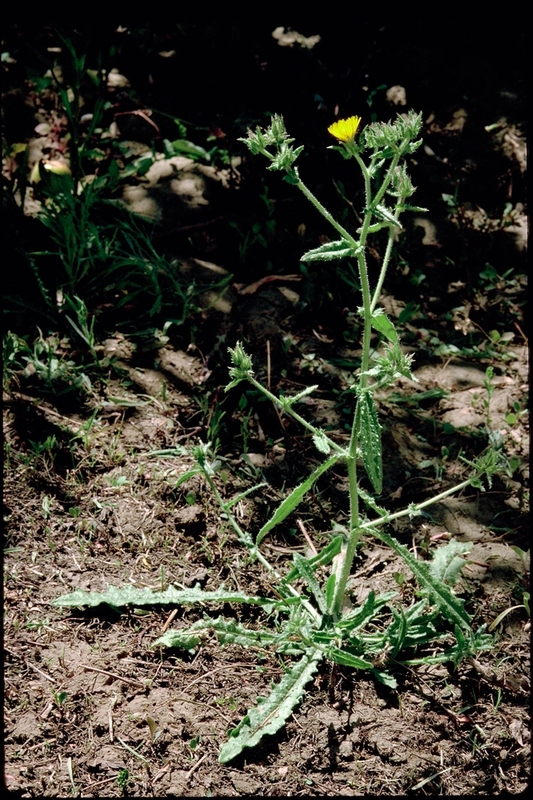 It was seeded in an area that had a high density of cheeseweed and has been effective at reducing the cheeseweed. However, chicory appeared to have created good habitat for gophers so if you don't want gophers, chicory would not be a good choice. Goats striped chicory leaves and rubbed their heads on stalks. Mr. Cent was also interested in finding companion plants to seed together. Based on his research, he found that plantain seed was often mixed with chicory seed, so he included plantain seed in the mix with chicory. During the first year plantain was not as successful as chicory. This year it's coming up better. The California Irrigation Management Information System (CIMIS) weather station in San Juan Valley indicates that the 19-year rainfall average for that area is 13 inches (http://www.cimis.water.ca.gov/Stations.aspx). Some data are missing for this weather station from the 2017 water year, so to give a sense of the difference in rainfall over the last 2 years, Hollister rainfall is given below. Hollister is about eight miles east of San Juan Bautista. The Western Regional Climate Center has weather stations throughout the west. The weather stations are called RAWS (Remote Automatic Weather Stations). Data from the Hollister RAWS station indicates that the 14-year average annual precipitation is 10.3 inches (https://raws.dri.edu/cgi-bin/rawMAIN.pl?caCHLR). Water year 2016 (October 1, 2015-September 30, 2016) was 11.7 inches, slightly above average. Water year 2017 (October 1, 2016-September 30, 2017 was 16.5 inches, substantially above average. Because rainfall was so different in these two years when Mr. Cent seeded his pasture, it's difficult to know which species will survive in the long-run, but he will likely keep experimenting! He understands that rehabilitating the pasture and controlling foxtail is not a one or two year project, but a much longer project, maybe five years or more. But, good research beforehand should bring quicker success. And it has! 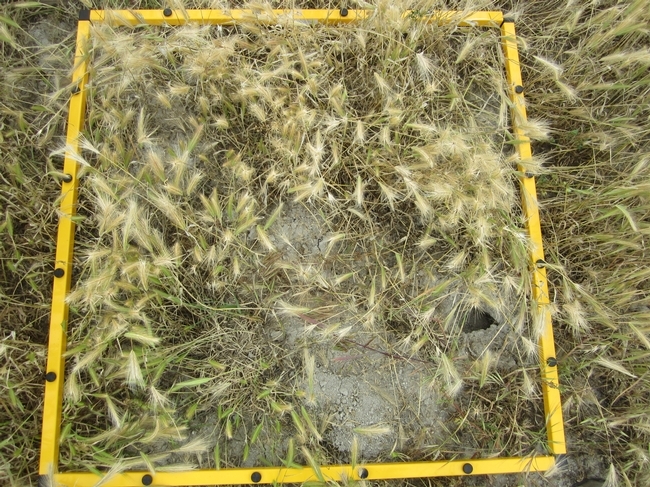 While there is still foxtail in the pasture, it's is substantially less than it was prior to seeding and goat grazing. Great article! 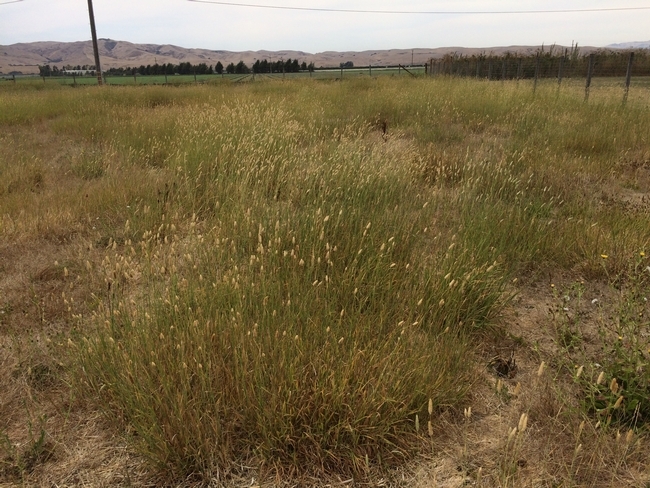 Foxtail has been a problem for many decades and its great to see some research into controlling without harsher treatments. Loved this article. So much valuable information. Something even the average home/land owner could put to use! Great article, Devii! Thank you for sharing! I'm on my neighborhood's park committee and we're dealing with this plant issue as it relates to dogs using the park. Very helpful post! Have a good one and thanks for all you do for the ranching communities and rangelands in this area!